I’m often asked by fellow marketers about what one should do when starting to work with Facebook as a marketing channel. I could go on for hours. Instead of listing up everything you should do – here’s a list of things you should avoid. Scheduling doesn’t matter as much as it used to. In the beginning, Facebook’s algorithms weren’t that smart. It served the simple purpose of sorting what you see based on who’s on your friendlist and what pages you like. Today, it’s much more than that. It continuously works to deliver content based on influence within your network of friends. This helps Facebook to show you content based on friends you have the most interactions with, as well as content Facebook thinks might be interesting to you. So, there is two things that decides what you see in your newsfeed: friends and subjects you show interest in. I share many articles on marketing, and click on links shared by people in my network as well. Naturally, Facebook serves me more of this type of content. But scheduling does matter – in the way that you can get work done and post content when you think people are online. Although, all hope isn’t lost if your audience is sleeping when you post. Regardless if they are online or not, Facebook will serve them your content if it thinks it might be interesting. 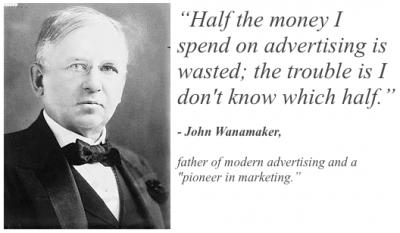 Reaching people with a message through marketing or advertising has never been free. So, you can embellish the truth as much as you like – but it won’t change the fact that you have to pay to reach people on Facebook with promotional content. From january this year, the social network decided to show less promotional content organically – you see, these should be adverts. Luckily – if you do a good enough job with targeting, testing and optimization, Facebook is still a cheap place to advertise. So don’t expect your journey to become a Facebook Marketing Superhero to be free – and give up when you realise that you might have to cash out. Work consistently, track everything and show the results to your boss. I’m sure he’ll cut the budget you use for print material and reallocate it for Facebook marketing in no time! While we’re on the subject of advertising..
With Facebook, you have the option to track visitors on your site. This is a powerful feature for all marketers wanting to re engage their visitors. Have you ever found yourself on travel related sites, only to go back to Facebook and be bombarded with hotels in the area you were looking at? This is remarketing on Facebook. Why does the different industries such as travel or webshops use this form for marketing so avidly? Because it works. They do convert. 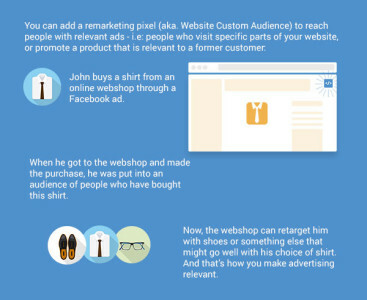 Remarketing can be a fantastic tool to re-engage potential customers and turn them to paying customers. But you have to tread very carefully. This is where selective exposure comes in. If you push irrelevant messages in front of people – for instance, pushing a product I have purchased to me, over and over again – I’ll selectively hide your ad. What this means to you, is that I’ll opt-out from viewing your post. I’m basically telling Facebook I’m not interested in viewing content from you. If it turns out many of your ads is irrelevant to me, and I opt out from seeing them – I might even opt out from ever seeing anything from you again. But at the end – setting up remarketing campaigns can be hard. You have to track pixels, create content and make sure they’re set to send traffic to the right place. I don’t blame you. But please, try to comprehend how your ads and the frequency of your ads is perceived. This is how you can avoid being an adhole: Simply treat your audiences differently. On one side you have the ones that visit your website but never completes a purchase, and then you have the ones that actually did. Now, why would you expose the latter group with the same ad? Simply exclude the people who have performed a purchase from the first remarketing campaign! If you’re clever enough, you can upsell to the latter group with something that might be relevant to what they purchased. Perhaps camera lenses to the ones that bought a camera from you? A landing page is where the user lands after clicking your ad. I’ve seen many examples of advertisers that spend time advertising like-contests without a goal or purpose. Regardless if you’re giving away an iPad or not – you need to get something back in return for your ad spend. If you use well crafted landing pages as a hub for your campaign you can gather email addresses or build Facebook Custom Audiences based on visits on that page. New giveaway or promotional contest? Great – now you have a list of people who might be in on upping the engagement around the new campaign! If you want – you can also reach people who look like these based on interest, demographics and geographics. With the acquisition of autoplaying videos in the News Feed – Facebook is going after similar social video networks. The algorithm that lies beneath your News Feed now prioritize their own video format over YouTube or Vimeo links. Personally, I’ve seen a difference of up to several hundred percent comparing a shared link and a video uploaded to Facebook natively. So, don’t share videos through YouTube links. Upload the video directly to Facebook. “Like and share th…” – No. Just no. Facebook’s new algorithm is a game changer. This means that what worked well before won’t work as well now. For instance – we saw before that posts where you encouraged people to like has had a peaked engagement rate. I’ve taken a deep dive into tons of data and learned that it isn’t much about what words you build your posts around (like/share, etc) but more about what type of content you share. So stop tweaking the mixture of the words you use to get more likes, and start spending more time creating content that you know will resonate with your audience. Don’t be a corporate brand. The harsh reality is that Facebook works for it’s users. Not agencies or advertisers. Tough pill to swallow – I know. But think of it more as a challenge. A challenge to stop being a faceless brand trying to cram corporate stockphotos and sleazy one-liners to your fans – and start being caring, daring and loving. Don’t miss out on testing. A great tip to take away from this post is to make sure you always split test your ad creatives as well as keeping an eye on the frequency and “negative feedback” of your adverts. If your frequency goes above what your audience can handle, they’ll either hide your advert or report you for spamming – which may have a negative effect on your total reach and cost. I have a motto I started living by the few recent years: test everything – always. Regardless of it being the color of a button on a landing page, or visual creatives for an ad. I always push out different variations to always make sure I’m trying out different things and testing for max effectivity. The opposite would be to sit back and watch how I’m missing out on return of my adspend. Now I know what works and not. Facebook is made for the users. Not for brands. Keep that in mind. We’re present at their mercy. Takin Kroop is the Senior Digital Marketer at Fanbooster - a company offering a platform for social media marketing and advertising. Takin is a true digital native, being only 23 years old. At Fanbooster he works on campaigns and marketing for the company itself, but he also work with customers such as Nordic Choice Hotels, Telenor, Canon and Santander Consumer Bank.